The Easiest Way to Clean Pomegranates! Pomegranate is one of the oldest known fruits, found in writings and artifacts of many cultures and native to old Persia. This nutrient dense, antioxidant rich fruit has been admired as a symbol of health, fertility and eternal life. 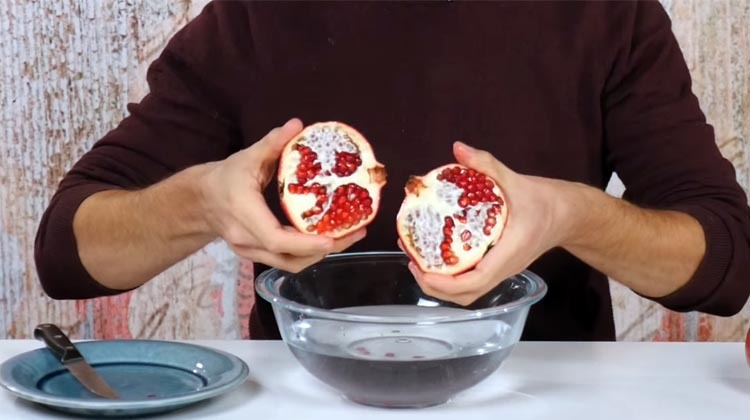 Seeding a pomegranate may look like a lot of work for just a piece of fruit, but getting at those seeds may just be well worth it. The pomegranate is a nutrient dense food source rich in phytochemical compounds. It contains high levels of flavonoids and polyphenols, potent antioxidants offering protection against heart disease and cancer. A glass of fresh pomegranate juice has more antioxidants than red wine, green tea, blueberries, and cranberries. Pomegranates are also good for your heart and blood vessels and they have been shown to inhibit breast cancer, prostate cancer, colon cancer, leukemia and to prevent vascular changes that promote tumor growth in lab animals. Several in vitro studies have shown pomegranate’s remarkable anti-cancer effect. Instead of avoiding pomegranates this season, try adjusting your technique. We have selected two of the easiest ways to clean pomegranates. Just follow the instructions in the videos and enjoy this amazing fruit!